Edinburgh is served by several cruise ports. All of the ports are located around the Firth of Forth (i.e. the estuary of the River Forth). Small cruise ships can dock either at Leith or at Rosyth. Large ships that cannot get under the Forth Rail Bridge, anchor and tender passengers into South Queensferry or New Haven. Above: The Forth Rail Bridge. Leith has been an important port for Edinburgh since the 14th century. In the 1990s, an extensive redevelopment plan was launched which has transformed the harbor area into a modern shopping, residential and office community. The cruise port at Leith is an enclosed harbor. Ships enter and exit through a set of locks, which limits the size of the ships that can use this port. 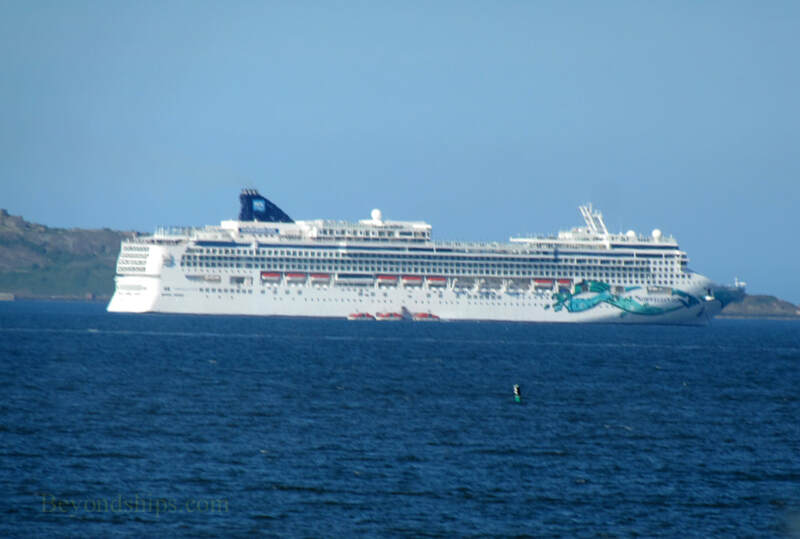 There are two cruise ship berths and a terminal building capable of serving ships in transit as well as ships beginning or ending a cruise in Edinburgh. 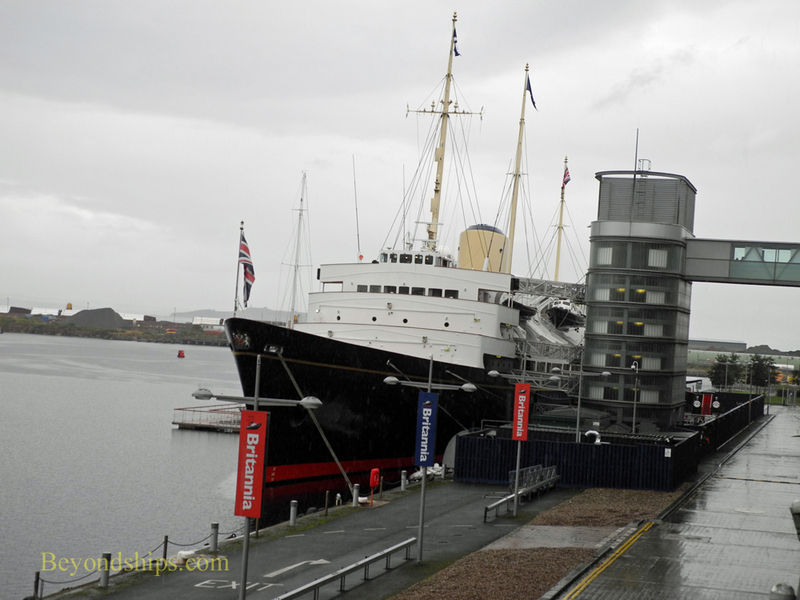 This is now also the home of the Royal Yacht Britannia. The cruise terminal is located about two miles from the center of Edinburgh. It can be reached from the city center by bus (Nos 11, 22 or 35) or by taxi. There is also a large car park nearby. Above: Cruise ships calling at Leith dock near the Royal Yacht Britannia. Above: Phoenix Reisen's Albatros. (Click here for a photo feature of Albatros sailing from Rosyth). Above right: Pacific Princess at Rosyth. Below right: Coaches pick up passengers next to where the ships dock and bring them to the terminal building or to the local railroad station. Rosyth was for many years an important naval base. It was from here that the battlecruiser squadrons commanded by Vice Admiral Sir David Beatty left to fight in the Battle of Jutland in the First World War. 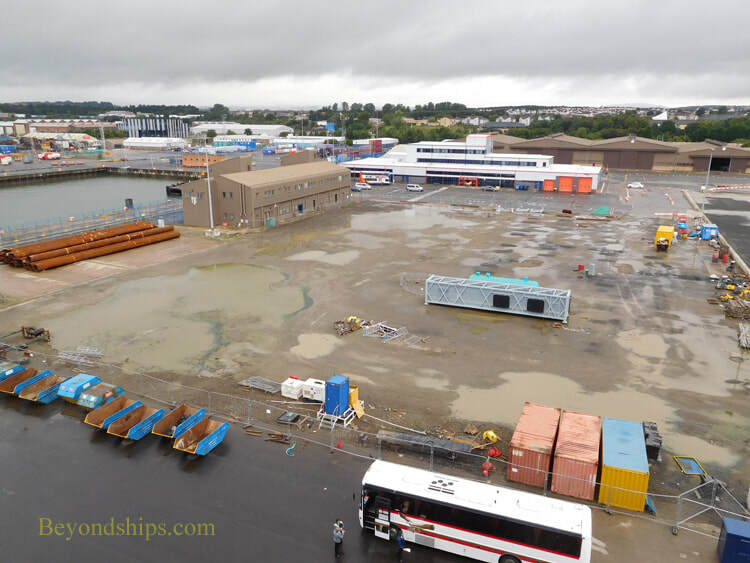 The military has now left although the future HMS Queen Elizabeth (aircraft carrier) is being built at the shipyard near where the cruise ships berth. This port is primarily a commercial port. Indeed, because there is so much freight traffic and construction work, cruise ship passengers are prohibited from walking from their ships to the terminal building. However, the port provides a shuttle to the terminal. Rosyth has two berths for cruise ships. Because it lies upriver from the Forth Rail Bridge, only small ships that can get under the bridge call there. Most ships calling at Rosyth are in transit. However, some cruises begin and/or end in Rosyth. There is a parking area in the port complex. The port is in a relatively isolated location. Consequently, cruise passengers traveling independently to Edinburgh usually take a shuttle or taxi to the train station at Inverkeithing. The destination is Waverly Station in the center of Edinburgh. Shore excursion coaches take the highway across the Forth Roadway Bridge into the city. The ride takes between half an hour to 45 minutes. 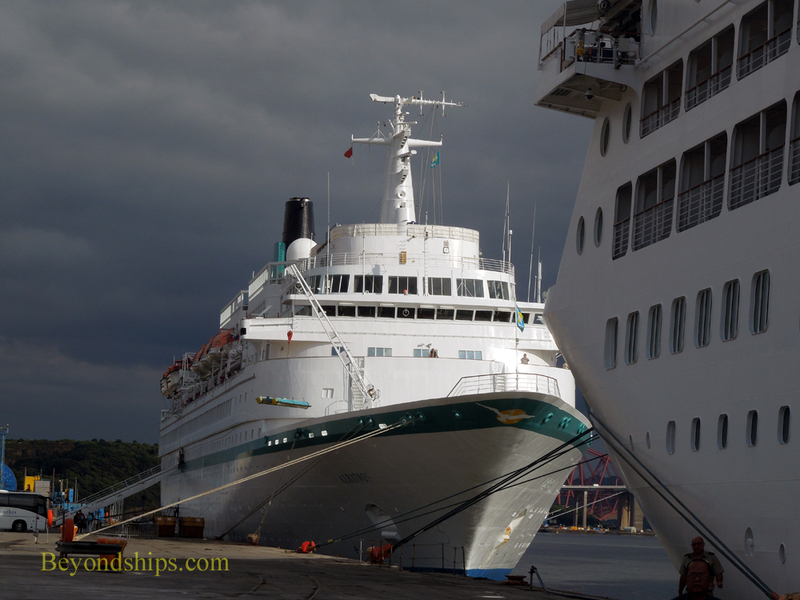 If you are on a large ship calling in Edinburgh, you will have to take a tender to go ashore. Many large cruise ships anchor at the Hounds Point Anchorage just down river from the Forth Railway Bridge. It is about a ten minute tender ride to shore, which takes you under the bridge and around to the Hawes Pier in South Queensferry. 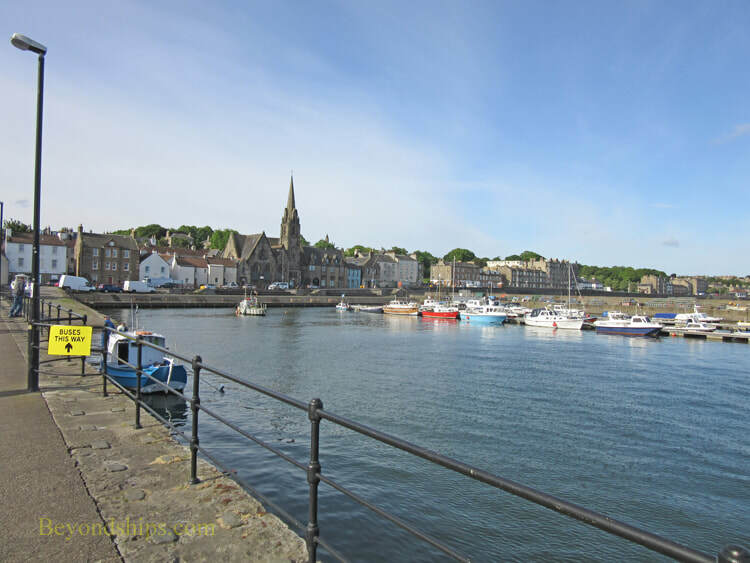 The town gets its name from Queen Margret of Scotland who established a ferry here in 1070. She had established a church at Dunfermline, which become a place of pilgrimage. People living on the other side of the Forth needed a way to get across in order to get to the church and so Margret paid for a ferry to transit the narrowest point in the Firth of Forth. It ran for 900 years until the Forth Road Bridge was built. The town where the ferry landed on the north side of the river is North Queensferry and the town on the south bank is called South Queensferry. Although South Queensferry is now part of the City of Edinburgh, it is a considerable distance (about 10 miles) to the city center. Independent travelers can take a train from Dalmeny Station, which is up the hill from the tender pier. Alternatively, the No. 43 bus goes to the city center from near the police station. 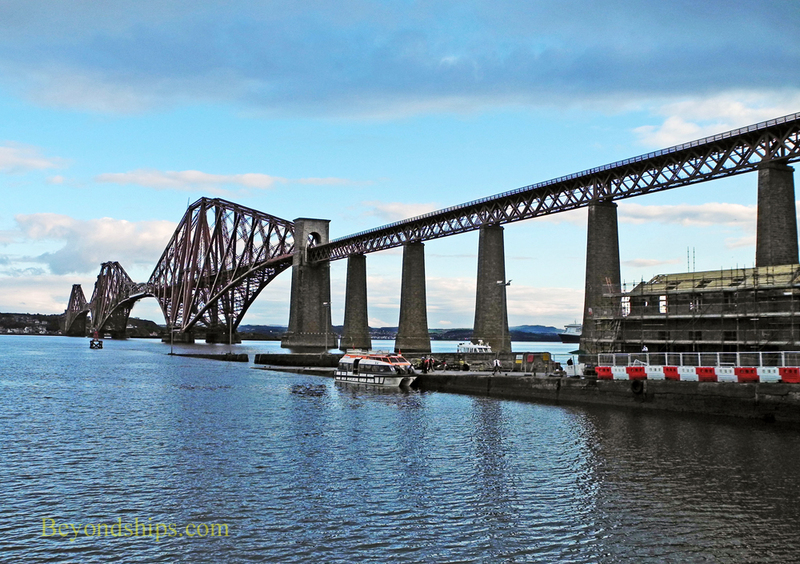 Above: Hawes Pier at South Queensferry lies next to the Forth Rail Bridge. Above left: Caribbean Princess anchored by the Forth Rail Bridge. 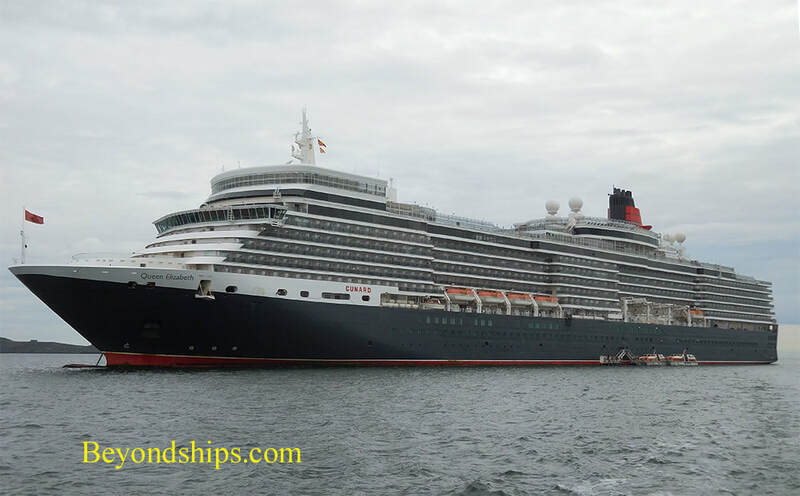 Below: Queen Mary 2 tendering from the Hounds Point Anchorage. 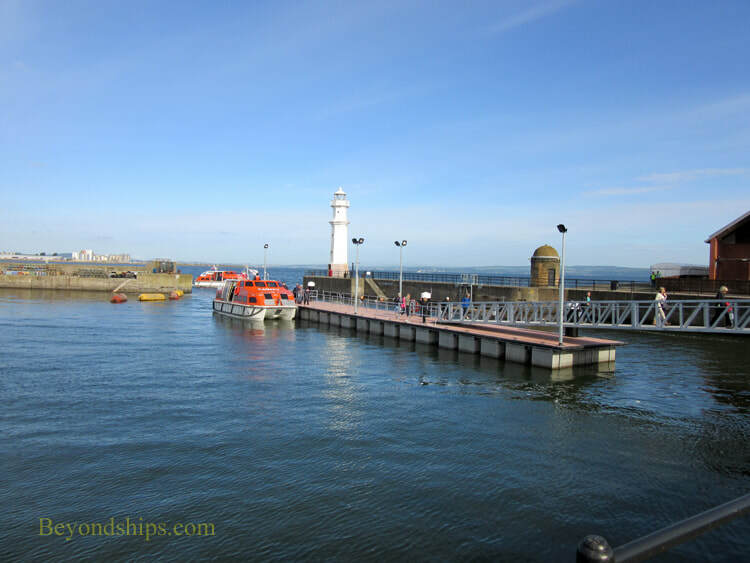 Another tender port used by large cruise ships calling at Edinburgh is New Haven. Formerly a fishing village, New Haven is a district in the City Of Edinburgh. It is located about two miles north of the city center. ​The tenders arrive in a small harbor that is sheltered by a sea wall. Most of the harbor is taken up with a maina for pleasure craft. On the quayside are several shops and restaurants. Above: Norwegian Jade tendering off New Haven. Right: The harbor at New Haven. ​Below: Queen Elizabeth off New Haven.